Wintery conditions returned to take another swipe at southern Manitoba on the Victoria Day long weekend. The Colorado low dumped 90 millimetres of precipitation on the Town of Melita in the southwest (more than 3 1/2 inches), mostly in the form of rain. But there was also snow, ice pellets, freezing rain and wind. Lots of wind. The City of Winnipeg, Winnipeg Beach and Gimli were all hit with wind gale-force winds of more than 90 kilometres an hour. They brought down trees, tree branches and power lines, knocking out power to thousands in various communities across the south. Manitoba Hydro repair crews were taxed to the limit. The rain left farmland along the Trans Canada Highway, west of Winnipeg, sodden and submerged. I shot this video from our car as we returned home to Neepawa from Winnipeg on Victoria Day, May 18th, along the north side of the Trans Canada Highway, west of the Portage junction. 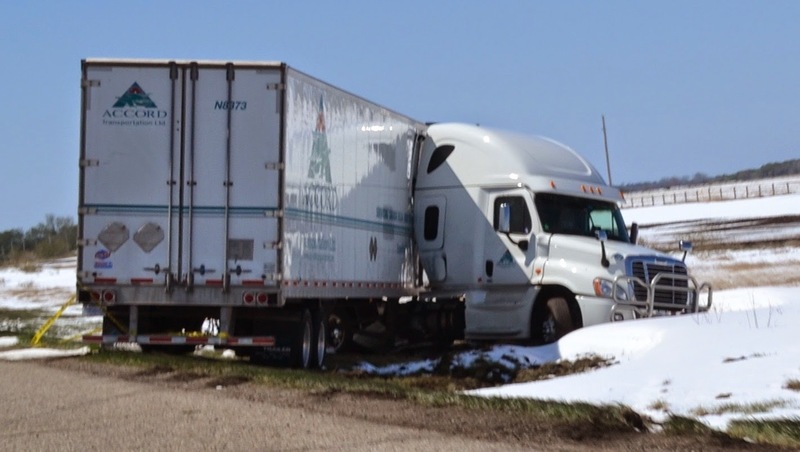 High winds are believed to have caused these accidents along the same section of roadway. Farmers who've already done significant field work in preparing for this year's planting season must be extremely nervous, given the terrible damage they've already suffered so frequently in recent years. Record, torrential rains and flooded crops have become tales that are all-too familiar as climate change seems to tighten its grip.